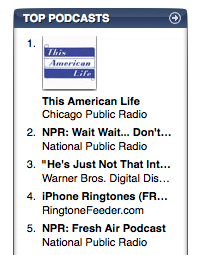 Wow – today the weekly RingtoneFeeder podcast ranked #4 across all podcasts in the US iTunes store! We are really excited about that and would like to thank you all for your support! If you haven’t already subscribed – you can sign up today starting from $1.98 or try out the free feed in iTunes where you will get a number of free iPhone ringtones including Worldwide hello, One more thing and Alternative Rock. You can also check out our iPhone Web App if you are seeing this post on your iPhone or get the latest iPhone Alarm Pack which has just been released. This entry was posted on Monday, June 22nd, 2009 at 11:30	by Administrator and is filed under News. You can follow any responses to this entry through the RSS 2.0 feed.